A big question that came up on my trip was the gear I was carrying. What does it take to do a self-propelled journey across the country, with weather that ranges from just above freezing (or below, depending on the time of year) to searing heat, with rain to contend with some days? With space and weight at a premium, you need to be selective. Everyone has their own strategies, here I’ll outline mine and some thoughts on what I would do for the next trip. I’ve heard of people riding across the country on bikes from Canadian Tire, racing bikes, fixed-gear bikes, and more. Before the trip I picked up the MEC National on clearance. This is a dedicated touring bike, designed to have a lot of weight on it, with proper mounts for panniers at the front and back. It can also accommodate a wide tire, important when you put 100+ kg of rider + gear on board. The bike came with a Brooks saddle, which was very comfortable. I have no complaints about the bike. It held up great, which is what you expect from something brand new. Ben featured with his touring bike. One of the reasons I was drawn to this bike was maintenance. Like most dedicated touring bikes, the components on this bike are all attached using bolts with Allen key heads, almost all in one size. The brake adjustments are done with an Allen key as well. Sometimes bikes have a mix of standard nuts & bolts, which require wrenches. I could do everything with one small multitool. Thankfully I didn’t have to do any real maintenance, beyond building the bike at the Vancouver airport and tearing it apart in Halifax. The bike also uses standard components everywhere. I could have walked in to any bike shop in the country and found replacement parts if necessary. I did pack an extra brake pad and some spare cables, which remain at the bottom of my bag. Avid readers will recall that I started the tour with Continental Gatorskin tires, one of the best puncture-resistant tires on the market. However, the tires were 28 mm wide, which was too narrow and caused some pinch flats due to the weight. In Kelowna I switched over to Continental Ride Tour tires, which are also quite puncture-resistant. At 37 mm wide they had a bit more rolling resistance but that was balanced out by the decline in flats (once I found the sneaky staple in the tire!). These tires lasted the final 6,000km of the trip and are getting bald, though I could likely get a couple more years of riding around town without gear before replacing them. In Sault Ste Marie I swapped the front and rear tire to even out the wear, otherwise the rear tire would have needed replacing in Ottawa. Some people will put a new tire on the rear each time it wears out and let the front age. Whatever works! For storage, I purchased two Ortlieb Back Roller Plus panniers, at 20L each, plus a MEC handlebar bag. This was plenty of storage, though it was a bit tight after each grocery run. However, if I do another big tour I will add front panniers to balance the weight out better to help the bike roll. I will try to avoid packing more gear though! My sleeping bag and tent went on the rear rack. If I were to buy front panniers the tent would likely go in one of them, with the poles on the rear rack. When I started the trip I already owned a complete set of camping gear intended for backpacking, so did not add anything new. My MEC Tarn 2 tent is spacious when travelling alone, and quite portable. I have a MEC Aquila down sleeping bag rated to -7C. Finally, I have a Thermarest NeoAir Xlite mattress. If I were buying new gear I would probably get a bivvy sack, which is smaller, lighter, and easier to set up than the tent but some people find them claustrophobic. They are pretty much coffin-sized. At the start of the trip I was using an MSR Dragonfly, which many consider to be the ultimate expedition stove. Many acquaintances had mentioned the MSR Pocket Rocket as the ideal compact backpacking stove. The Dragonfly weighs nearly a pound, and is quite bulky, though it comes with a great stand that makes cooking in odd environments tolerable. Jealous of other bike campers who didn’t need to prime their stoves, in Winnipeg I switched to the ultimate backpacking stove, the MSR Pocket Rocket 2. In Kelowna I had ditched my nested pot set, retaining the 2L pot, knowing that my friends would bring then rest to Toronto. Finally, I ditched the 2L pot and switched to a titanium 0.75L pot. The new kit weighed about one pound, so a great drop in volume and a 50% drop in weight, without any compromise on the simmer control. The Pocket Rocket is easy to set up, doesn’t require priming, and boils water quickly. The only downside is that the fuel can only be purchased from specialty camping stores, so a bit of forethought is required so that the more desolate stretches don’t end up being coffee-free. My bike could carry two water bottles on the frame, each about 750mL. Some bikes have three or more mounting points. To supplement this, I stashed two bottles in my panniers. In addition, I had a Platypus water purifier and two 4-litre bags that come with it. I did not take the platypus out of its package, however. My water strategy was to top up at every opportunity – be it a gas station, restaurant, visitor centre, etc. It was sometimes awkward trying to fit the bottles under a bathroom sink, but I made it work. I stayed at campsites most nights, so water was readily available, otherwise the Platypus would’ve gotten a workout. Sometimes I pulled water for cooking straight from the lake or river, then boiled it. This is generally a safe method in Canada. I found I was drinking a water bottle every 2-3 hours typically, and every hour when passing through the heat wave in Ontario and Quebec. This is in addition to a full water bottle as soon as I woke up, plus some additional water at the campsite in the evening, plus water for cooking (usually one litre per day for cooking & rinsing). If I had shopped for new gear, I would have the same strategy for refills but would have purchased a 4-litre bladder for the days with less opportunity for refills, and strap that to the back rack, rather than packing the Platypus. Water purification tablets are apparently a great alternative to the Platypus, which is somewhat bulky and not particularly cheap. The remainder of the equipment was pants, a sweater, and clean undergarments. This took much more space than expected, an entire 20L pack. Apart from a medium-weight sweater & a wool hat everything was used constantly. 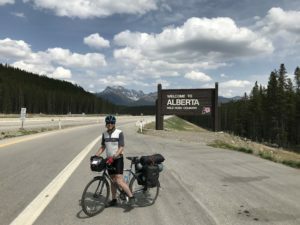 I had expected the Rockies to be a little cooler, but a long-sleeve merino tee from MEC, sometimes coupled with my shell, turned out to be plenty for the evenings. In Kelowna I picked up the long-sleeve merino t-shirt from MEC and some pants from Lululemon. Neither was cheap but each provided a nice protection from mosquitoes. The pants are very packable, lightweight, and look great for going out to restaurants. In Ottawa I added a sleeveless t-shirt to my outfits, which was perfect for cycling on hot days. Versatility is the key when packing for a bike trip. Next time, I will refine my clothing a little further. My approach started with “cycling” gear and adding an outfit for the campsite, but one cycling jersey was not particularly comfortable and having a sleeveless shirt was necessary in the summer heat. No modern adventure is complete without a suite of electronics. Some people travel with serious camera setups, iPads, laptops, etc. My general advice would be to use the phone you have and use its camera. Some people bring solar chargers and strap them to the back of their bike. The combo that worked for me was my iPhone 7, a GoPro (which was used twice! ), a 7800 mAh battery pack (roughly 3 full iPhone charges) with two USB ports, two sets of USB rechargeable bike lights, a Petzl Actik headlamp with the USB rechargeable core battery, a Garmin Forerunner 235 watch, and a pair of Apple AirPod headphones. Note that I would not actually recommend buying any of the above electronics for a trip. There are often cheaper equivalents that will do just fine. I own the watch because it is the brains behind my run training. The headlamp was purchased for trail running, and it was cheaper to buy the Actik with the USB recharging battery included than to buy the next-best light and purchase the battery separately. The 300 lumen strength is overkill for just about any application. The GoPro was barely used, but I bought it six years ago. If you already have similar devices they will work just fine. If you want to measure a bunch of stats on your trip there are cheap (less than $50) cycle computers that will do the trick. Before the trip I charged the headlamp, it never needed a top-up due to extremely limited use. I also generally used it in red light mode since that does not attract bugs or ruin your night vision. The bike lights needed to be recharged once or twice, again they were used sparingly. A friend lent me his 4-port, 40W Anker USB charger, which could do a high-speed charge to four devices at once and fit in a tiny package. This was extremely handy. What worked for me was to keep the phone around 30-50% charged, leave it in airplane mode except when using it, and then any time I was stopped and an outlet was nearby the phone, battery pack, and watch would get plugged in. Why not keep the phone at 100%? It made far more sense to use the full potential of the 4-port charger and have the phone & battery pack charging for 30 minutes than to drain the battery pack and barely fill it back up when stopped. This way I could usually go five or more days without needing an overnight charge for the battery pack, which was sometimes hard to find. If I was at a campsite, or knew I would be going to a campsite, I would charge the phone to 100% using the battery pack, then do the same with the watch as soon as I stopped, and then stash the battery pack in the washroom or wherever there was an outlet and retrieve it a few hours later. That way I only risked having a $80 battery pack stolen, not several thousand dollars worth of other electronics. Some people meticulously measure their power needs before the trip. This seems like overkill to me. An iPhone has a 2,900 mAh battery. The GoPro was a third of that. My watch was probably a third of that again. The lights were rarely used but were probably a couple hundred mAh each. Basically, the iPhone was by far the biggest power user, everything else would probably combine for half an iPhone charge. So, get a battery that can charge a smartphone 2-3 times and go on your way. 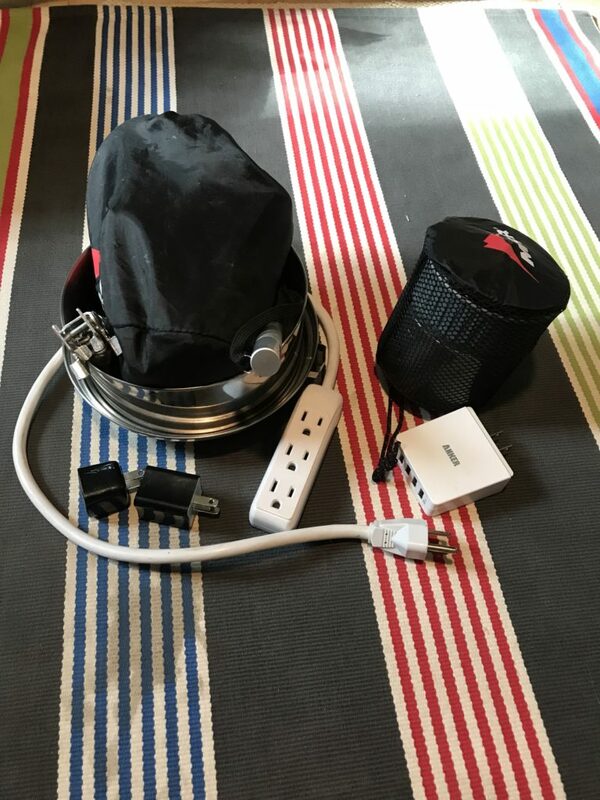 A solar charger is a complete waste of money in my view, as a decent one is close to $200, but if you do a lot of wilderness camping and already own one, go for it! I ended up spending some money on gear that really didn’t get used, like a pair of gloves that turned out to be incredibly ill-fitting, and toe caps for my cycling shoes that were recommended for cold or rainy days. Many people I encountered eschewed cycling shoes altogether, preferring a solid sneaker intended for hiking on established trails, something that would be more comfortable in general and also fine for wearing off the bike. While cleated cycling shoes do make riding slightly more efficient, when spending eight hours per day in the saddle comfort ranks higher. On the very last day of the trip I learned about a book called “Just Ride” by Grant Petersen. As the book was explained to me I realized that my outlook on cycle touring was now perfectly aligned with Petersen’s philosophy. He entirely avoids cycling gear and recommends riding with a simple setup – not even padded shorts! The book apparently rips apart the Velominati, the cult that runs cycling culture in North America. In all my years as a bicycle advocate I found myself explaining that 1) I wear a suit, 2) I don’t really ride my bike except around my neighbourhood, 3) I don’t sweat, 4) my bike is not worth as much as a family car. These principles seemed shocking to people, who evidently also see no difference between Formula 1 and commuting to work. I am curious to grab Petersen’s book and dive deeper into his philosophy. Just don’t overthink it. The money spent on cycling gear would have been better spent elsewhere and will now take up space in my cramped apartment for use a couple of times per year. If you’re planning your own tour, I encourage you to try a short tour with his philosophy and see if you need more gear to be comfortable. I haven’t determined what will be next, but now that I have the above gear and a simpler philosophy on touring I am eager to do something else. Maybe some weekend trips through southern Ontario next summer, taking advantage of the extensive GO train network to get me out of the city. My next cross-country tour will likely be on a bike share bike, those heavy, overbuilt three-speed bikes famous in Montreal and New York. A €2 oBike rental in Rome would allow me to bike across the Vatican, in casual shorts and a t-shirt. This sounds appealing. Thank you to everyone who has followed this adventure – I’m happy to answer any questions you have, either in the comments below or by email or over a beer. I still hope to publish a post in the coming days with an overall impression of the trip, then it will be back to regularly scheduled musings about cities. Obviously weight factors in here!! I’ll update the content – lots of water in Canada! Hi Ben We loved hearing about your adventure from Mom and Dad. I enjoyed reading this post and will follow your journey as time allows. This was an amazing accomplishment. wishing you well as you start your MBA studies. Thank you for following the adventure! It was nice to run in to both of you just before it started.